Israeli Prime Minister Ariel Sharon told a reporter he has "decided to make every effort to reach a settlement" with the Palestinians. 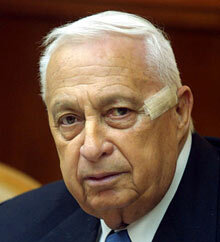 JERUSALEM (CNN) -- Israel must make "painful concessions" to help achieve Mideast peace by giving up some Jewish settlements in Palestinian territory, Israeli Prime Minister Ariel Sharon said in Sunday's editions of the newspaper Ha'aretz. Asked specifically about Netzarim, an isolated settlement in central Gaza that has been a flash point between Israelis and Palestinians, Sharon said, "I don't want to get into a discussion of any specific place now. This is a delicate subject. "But if it turns out that we have someone to talk to, that they understand that peace is neither terrorism nor subversion against Israel, then I would definitely say that we will have to take steps that are painful for every Jew and painful for me personally," he said. The "someone" Sharon referred to might be the new Palestinian prime minister, Mahmoud Abbas, who accepted leadership of the Palestinian Authority's day-to-day operations last month. Abbas also is known as Abu Mazen. In a further reference to the settlements, which have been one of many sticking points in reaching an accord between Israelis and Palestinians, Sharon said, "Look, we are talking about the cradle of the Jewish people. Our whole history is bound up with these places. "Bethlehem, Shiloh, Beit El. And I know that we will have to part with some of these places," he said. "As a Jew, this agonizes me. But I have decided to make every effort to reach a settlement. I feel that the rational necessity to reach a settlement is overcoming my feelings." Sharon added, "If we [are to] reach a situation of true peace, real peace, peace for generations, we will have to make painful concessions. Not in exchange for promises, but rather in exchange for peace." He said, however, that he has told U.S. President Bush that he will not make concessions that jeopardize Israel's security. In February, Israeli forces shot and killed an armed Palestinian trying to infiltrate the Jewish settlement at Netzarim, according to the Israel Defense Forces. Palestinian security forces confirmed that a Palestinian had been killed there, but did not comment on the IDF report about an attempted infiltration. In March, the IDF said three Palestinian militants who attacked a civilian convoy were shot dead by Israeli troops near Netzarim. Islamic Jihad claimed responsibility for the attack, saying the three Palestinians killed were members of that organization.